Hello everyone! 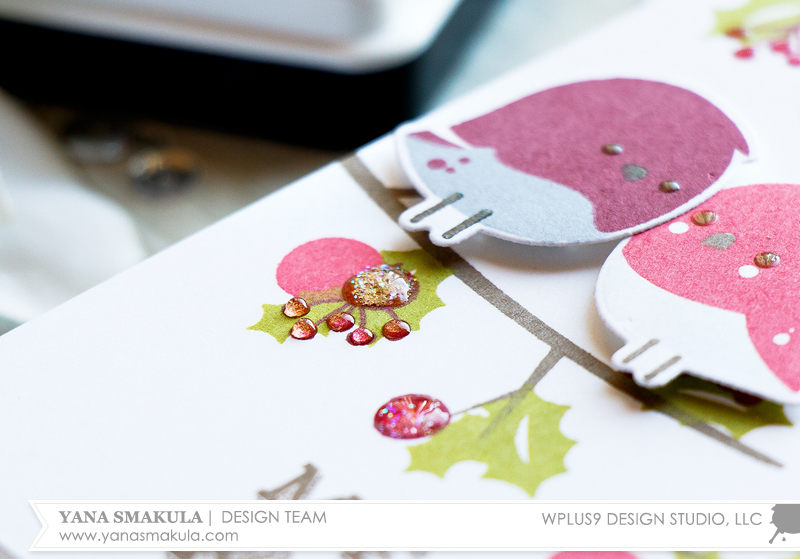 This is Yana Smakula and for today’s blog post and video I pulled out a few stamp sets and combined them on a card to create a festive Holiday scene. 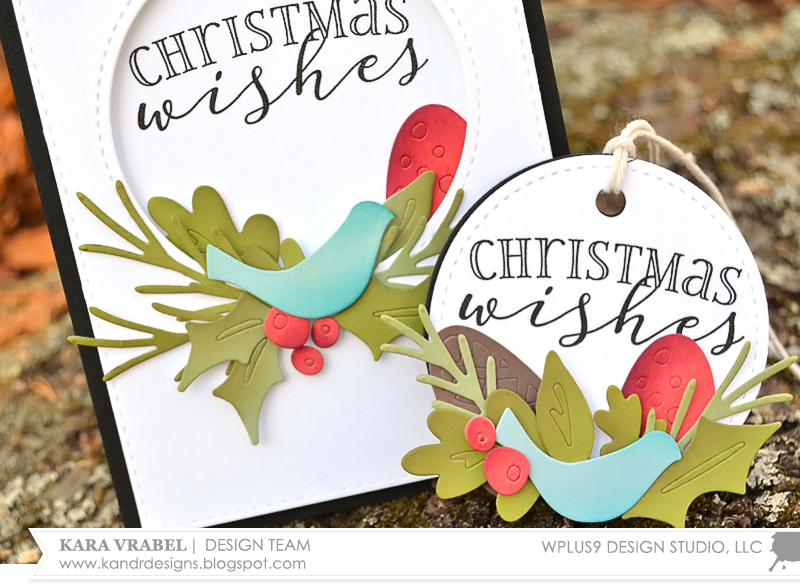 Lately I’ve been enjoying using images from different stamp sets and creating various patterns/scenes, so I thought it would be fun to play with a few Holiday sets and share some of my tips for mixing and matching images. 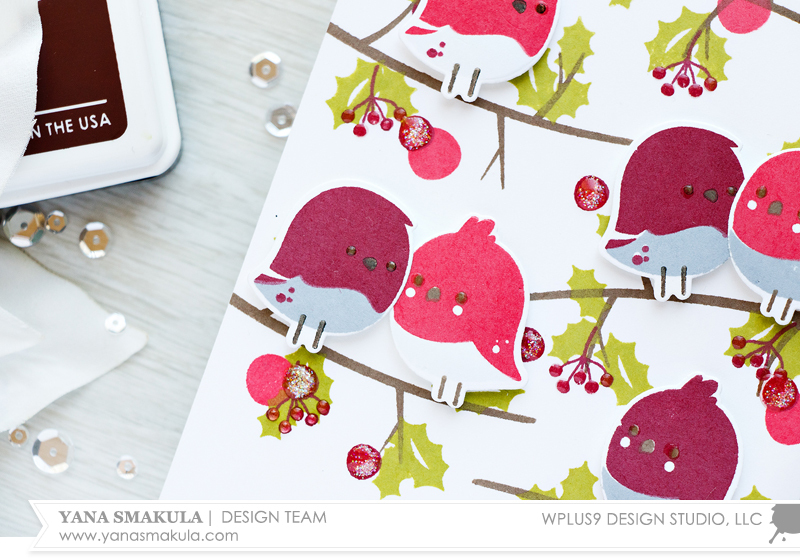 I knew I wanted to have several birds from the All Year Cheer stamp set sitting on the front of my card and singing Holiday Cheer. So I started looking for ways I could create a fun and natural-looking background for them. I started by stamping several branches from the same All Year Cheer set in Coconut Husk dye ink. This is a nice brown color that works great for stamping woodgrain patterns or wood-like images. I rotated the branch image and ended up having some branches facing down and some facing up. If you’d like to have more branch variety on your project you can manipulate the stamp slightly and curve it a bit to have the branch bow some more or become flatter. 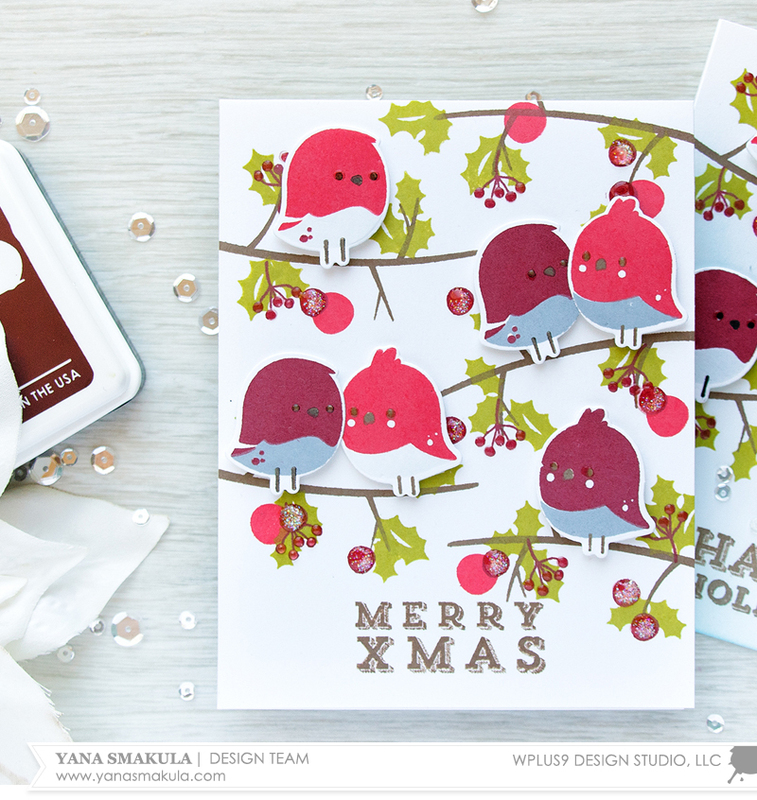 I also used two circle images from the All Year Cheer set and stamped ornament-like circles in Cranberry Crush and Gala Red ink colors. 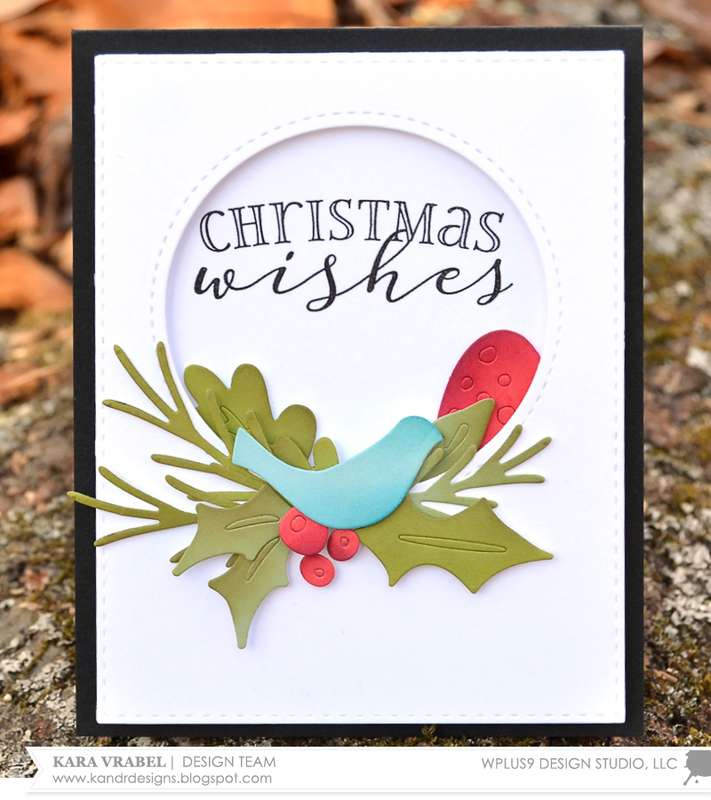 I knew I wanted to add some holly leaves to complete my branches, but there weren’t any suitable leaves in the All Year Cheer set so that’s when I started looking for images in my other stamp sets. The Be Merry Florals set seemed like a perfect fit, so I used two leaves and also a berry branch and stamped them in Last Leaf and Cranberry Crush. I try to make sure the style of the imagery I use is the same. 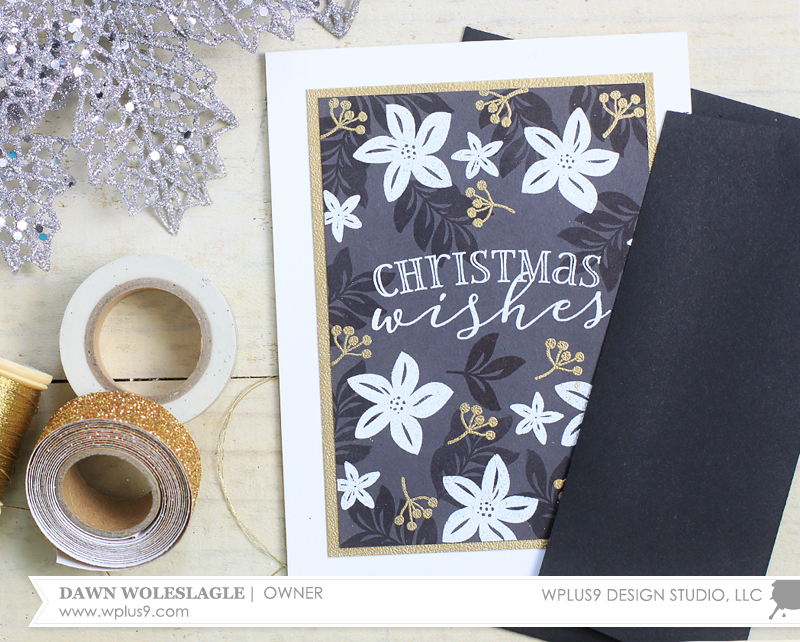 For example, if I am using outline images from one set, I will look for outline images in other sets to compliment my stamping. If I am using solid images, like I am doing here, my birds are all solid, my branch is solid, my ornaments are solid and so I look for solid leaves. I do sometimes mix solid and outline images on one pattern, but not very often. 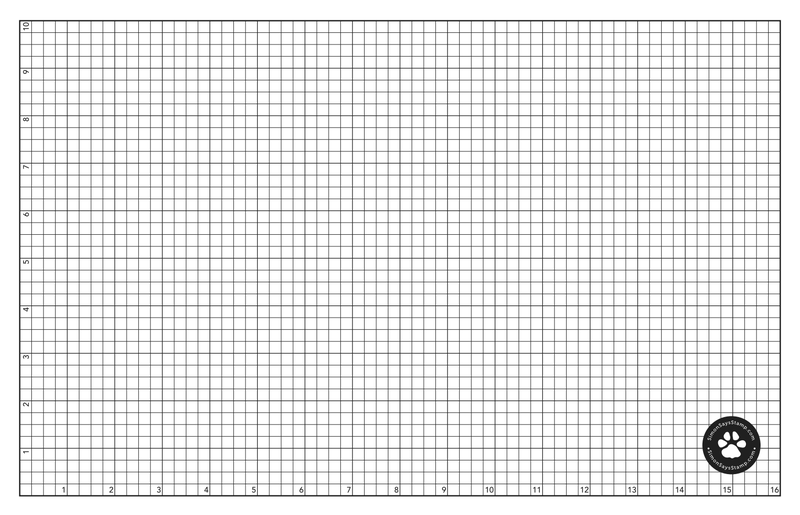 I also look at the scale of my images. 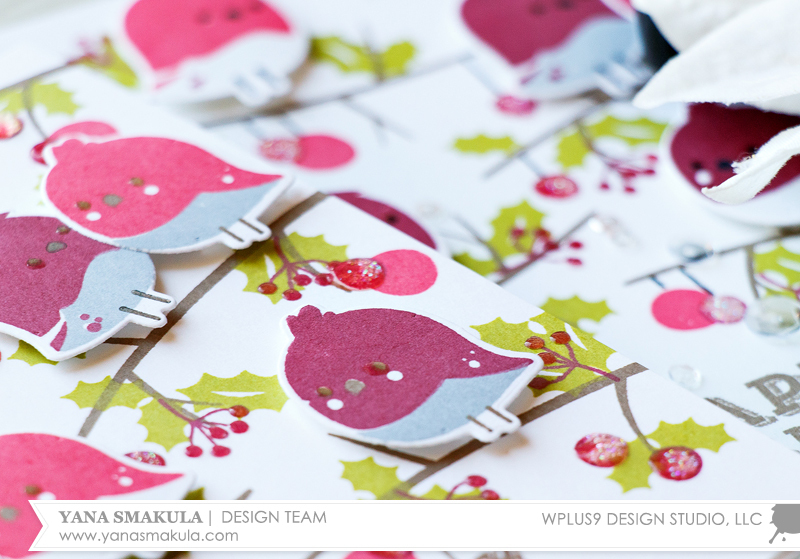 For example, I want my leaves, my branches and my ornaments to look proportional to my birds. I don't want to have giant birds and tiny leaves and vice versa. Thanks for joining me today! Have fun stamping! Good Morning! I hope all of you who celebrate had a wonderful Thanksgiving! While our family was here I showed my mom all of the Christmas cards I have made so far, and when she saw this one, she put in a request for it! So she will be getting this card and tag this year. These were a lot of fun to make. There is almost no stamping on this project. The sentiment is the only stamping, but it is still full of color and interest. Die sets like Woodland Basics make that possible. I started by die cutting all the images in the die set several times from white cardstock. It's always better to have more than you need so you don't have to go back and create more pieces when you are ready to assemble. You could die cut them from different colors of cardstock instead, but for me the fun part is adding the color. I do that by using a sponge dauber and my PURE Color Dye Inks. I added a base color first to all of the die cuts. Then when that layer of ink was dry, I added a deeper shade of that color for shading. When all of the die cut pieces have been colored it's time to assemble. This is really fun because you have everything you need already made and you get to move things around until it's just the way you want it! Once you get it the way that looks best to you, snap a picture with your phone. This makes adhering all the pieces back in place so much easier. I assembled my pieces at the bottom of a circle die cut window I created using the Love Mom Layers die. I stamped my sentiment, from Be Merry, inside the window. Because I had prepared so many pieces and had the die cut circle left over from the card, I was able to finish my card and create a matching gift tag! I added some clear Wink Of Stella over all of the die cut pieces and in the real life the shimmer is beautiful! Thank you so much for stopping by today! I look forward to seeing you again soon to share the upcoming December Release! Hello! I feel like it's been awhile since I've shared anything with you guys. Oh, I've been creating and filming...but something always seems to come up before I have time to do editing and voice overs. So we are fixing that starting today, with these beauties! There is something about a simple color combination of black, white & gold that is so elegant. 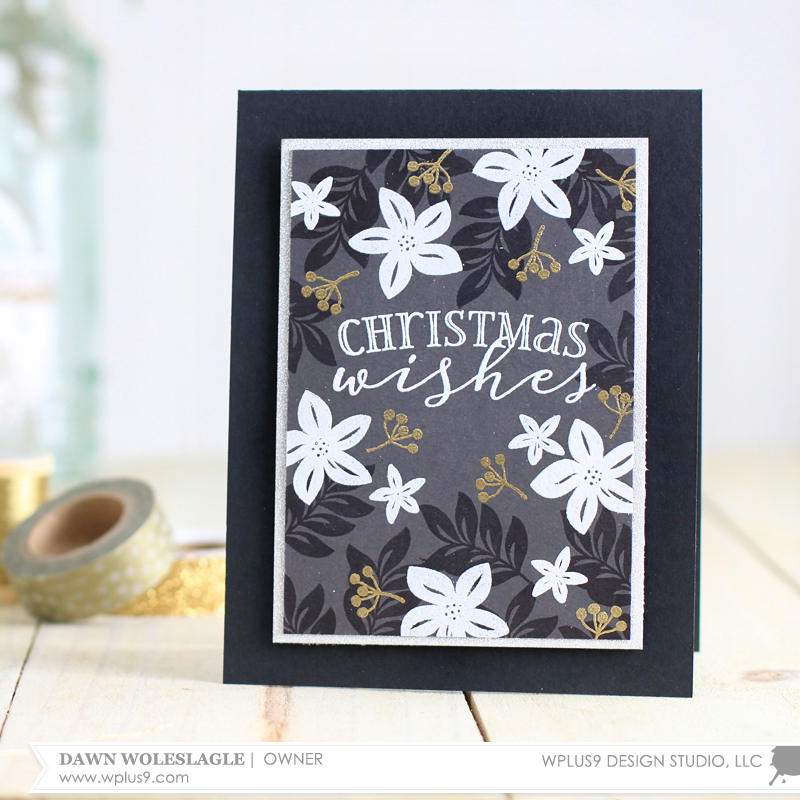 I knew I wanted to incorporate this classic combo with our new Be Merry Florals stamp set and this is what I came up with. You can watch below to see how easy these are to recreate. They utilize a lot of heat embossing, but few supplies beyond that. 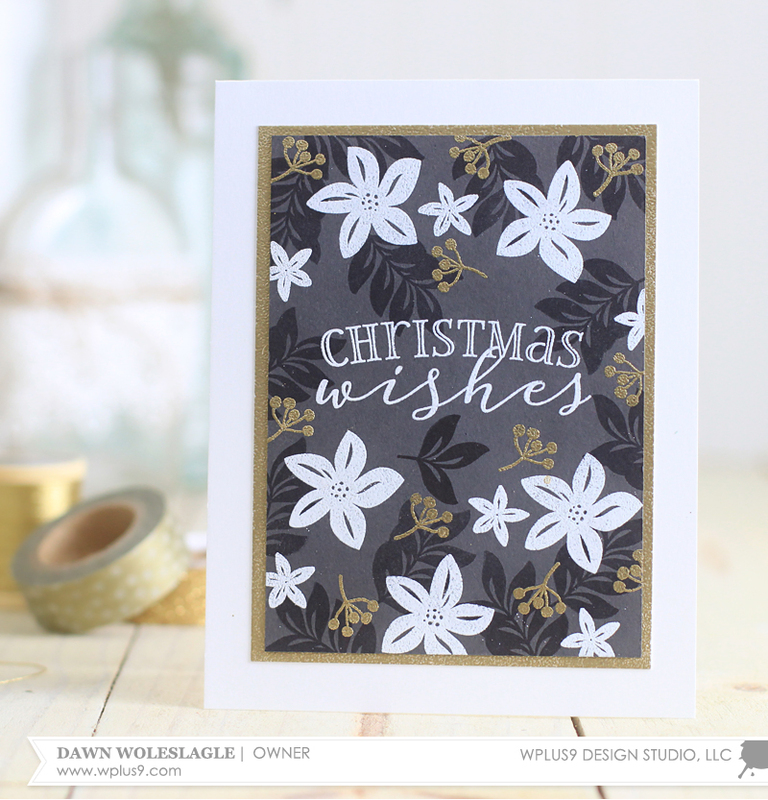 I started by stamping my background leaves in Black onto Coal Mine card stock, and then heat embossed my sentiment in white. 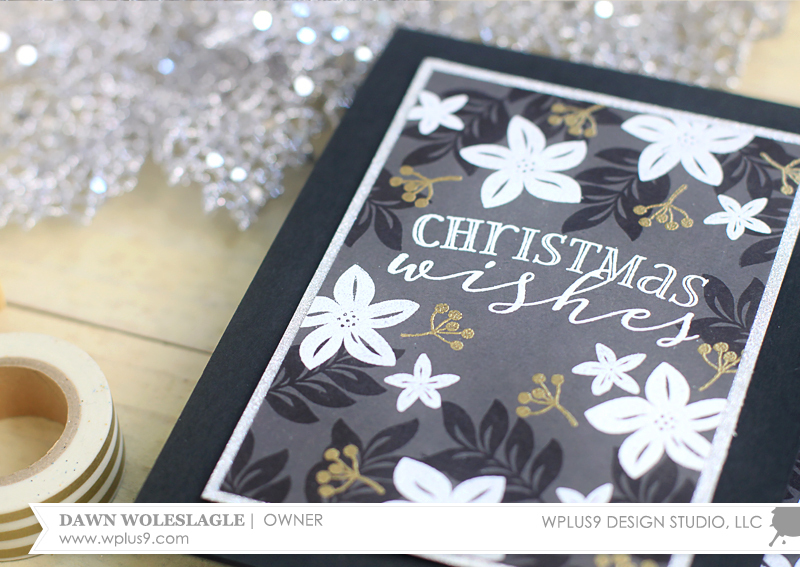 I then added all of my white floral heat embossing, followed by the gold heat embossing. I matted each version with a metallic card stock. 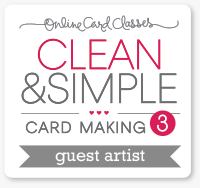 But, you could definitely forego the mat for an even more clean and simple version. 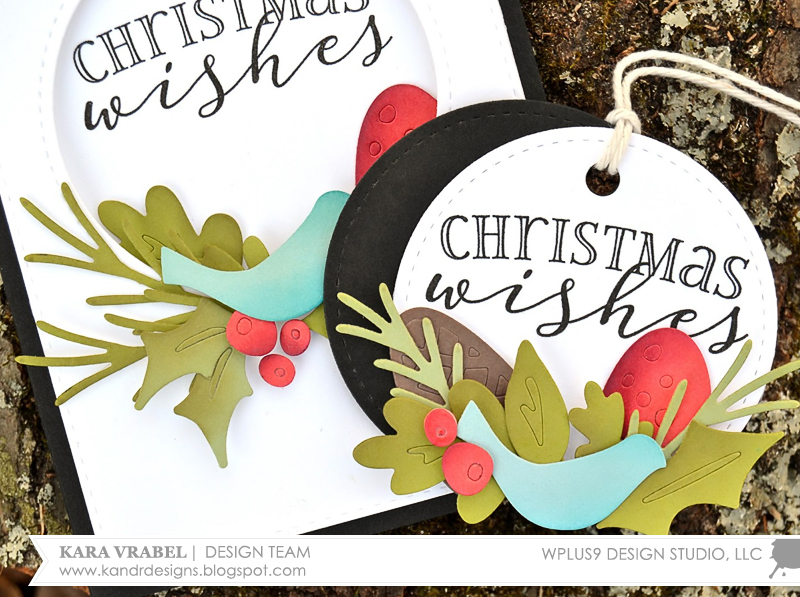 I think this layout and technique would look beautiful with colored embossing powder as well. How about you? If you try it out, I'd love to see. Be sure to post on social media and tag #wplus9 to share yours! Thank you so much for stopping by today! And for those of us celebrating, I hope you have a wonderful and safe Thanksgiving!